11.11.11.11, a photo by Georgie Sharp on Flickr. I am currently working on an interactive version of the Family Tree to pass on to the new grand children. 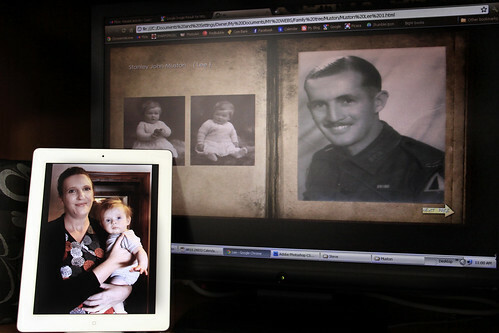 Lucky for me my sister Steph has done all the hard work of tracing family members and really all I have to do is transfer the information and add pictures. The 11th of the 11th of the 11th of the 11th seemed like the perfect opportunity to remember Lee (my father) who fought in WW2. Lee (Stanley John Muston) put up his age to 17 so that he could join the army with his friends and head off overseas on a big adventure. He served in the Middle East as a driver, transporting Italian prisoners of war and later saw action in New Guinea. Many of his friends were killed in combat. Although he didn't talk much about his war experiences he told one story about being taken off a plane in New Guinea to make room for a commanding officer. The plane crashed not long after take off with no survivors. When he returned from the war he took the attitude that life is here to enjoy and people can choose to make the most of opportunities.